It drives my wife Ashley crazy, but I constantly walk around shutting off lights and reminding the household to shut lights off when they’re not in use. I get that from my dad. The older I get, I can see more and more things I’ve picked up from my father. Aside from the annoying tendencies, I was lucky enough to inherit the generous, kind and loving characteristics that describe my dad. He’s also the hardest working man I’ve ever known. He should be retired, but he just can’t help but keep working. As we celebrate Father’s Day this month, I think back to all the things I’ve enjoyed with my dad – from playing basketball in our driveway back in the day to golfing together these days. And he’s always made a point to attend at least a few shows of every band I’ve played in. I not only think about those things but how I am enjoying similar activities with my own son Jaxson. He’s only 6, but he’s already an amazing drummer in his own right, enjoys hitting the golf course with me (he can already hit his little driver around 80 yards) and loves playing basketball – all things I enjoy. There was a time when I had given up on my dream of being a dad … then, thankfully, fate intervened and I’ve been blessed with an amazing wife and son. I send out a huge thank you to my dad and all the fathers out there. Speaking of fathers, read Carol Thompson’s story about Jay Alcenius, a retired Air Force master sergeant who’s applying some of what he’s learned from being a dad to his new “job” of being Santa. You can also read my story about another father, Max Nazarenus, who along with his wife Georgene, built a new senior apartment building. 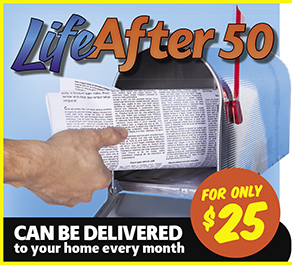 Thanks as always for reading Life After 50. I wish more people had love and respect for their parents. You’re a good man, a good parent because you have respect for your Dad. Love and respect.